F.X. Matt Brewing CEO Nick Matt, in blue blazer, discusses the brewery's addition of an anaerobic digester. F.X. Matt Brewing CEO Nick Matt, in blue blazer, looks over parts for the brewery's addition. 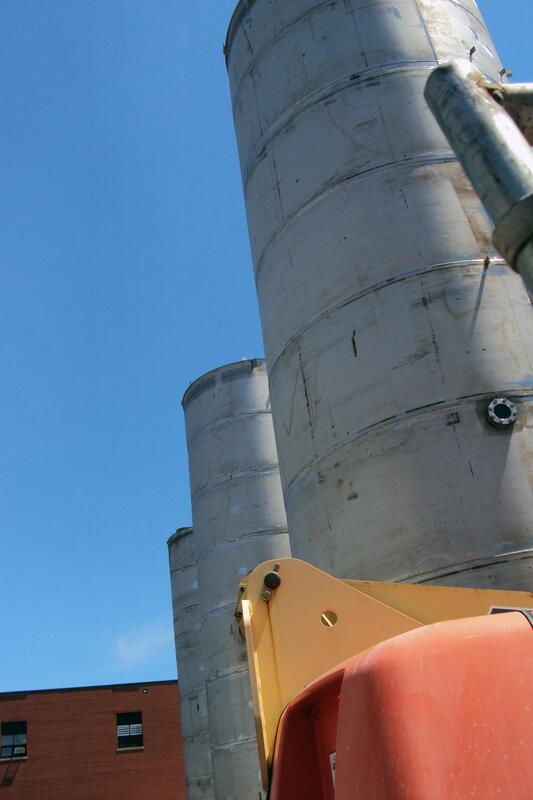 Three of the brewery's new anaerobic digester tanks were installed last week. Crews are working to install a new biodigester at F.X. Matt Brewing in Utica, N.Y.
Five big new tanks have arrived at the F.X. Matt Brewing Company in Utica. But they won't be used to make the brewery's signature Saranac brand craft beer. Instead, the tanks will act as anaerobic digesters for the brewery's wastewater. Special bacteria will munch on the yeast and grains left floating around. The process will get the water about 85 percent cleaner before it's discharged into the sewer system, according to CEO Nick Matt. But the digestion process also gives off methane gas and carbon dioxide. That methane will be used to power a generator. CEO Matt says the new system will cover up to 40 percent of the brewery's electricity needs. "It's kind of win-win," says Matt. "It works from the standpoint of cleaning up the wastewater, but then we get this benefit of energy generation." 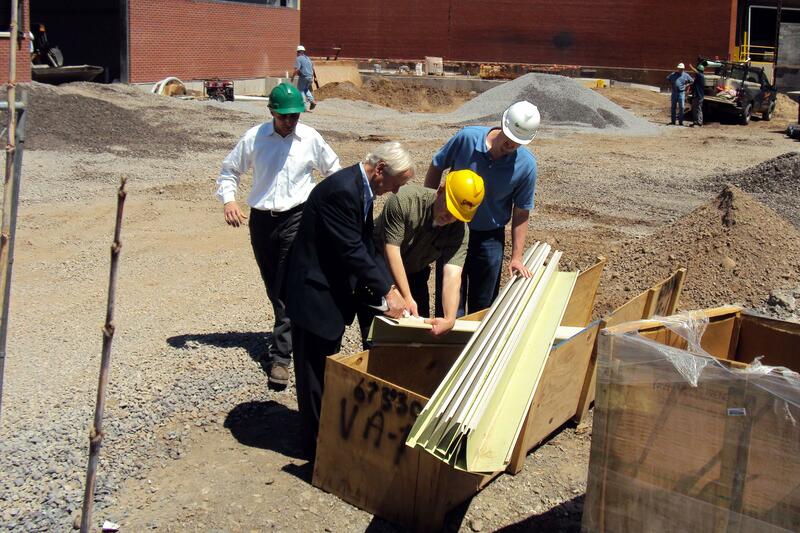 The SUNY College of Environmental Science and Forestry is helping coordinate the project. The college hopes to create a new class around the brewery's digester. Matt Brewing has been making beer in Utica for over 100 years. Operations were temporarily shut down four years ago when there was a fire in the brew house. But business has blossomed since. Saranac is putting up about $4.5 million for the digester, according to Matt, who is the grandson of founder F.X. Matt. 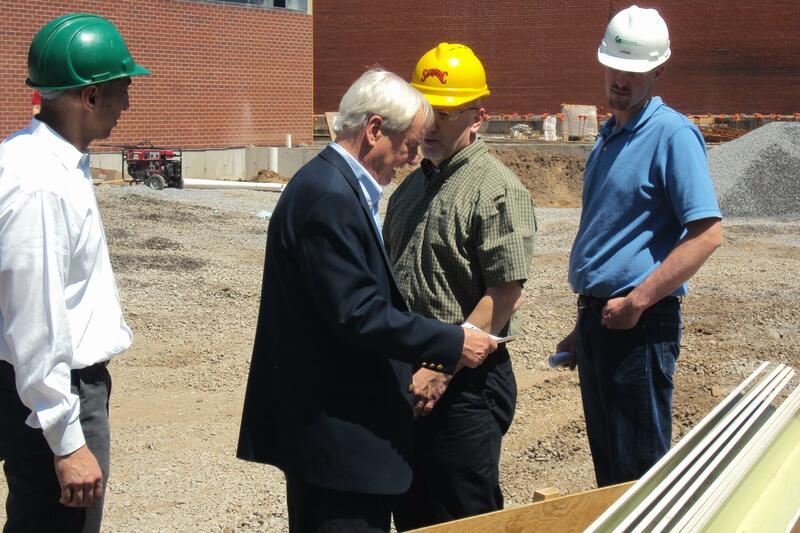 After grants and energy credits, Matt estimates the price tag will end up being around $1.5 million. While the project is good for the environment, the businessman in Matt also sees it as a marketing opportunity. "For us to have a project that is very visible like this and that people discover about us and say, 'They're doing some really nice things down there,' " Matt says. "We're trying to catch people's attention in a different way." The digester is expected to be up and running by the fall. Craft beer has proven recession-proof. Its sales have accelerated while the overall beer market remains flat. So in 2010, when two college friends from RIT decided to make a home brewing hobby into a full-fledged business, it wasn't actually that far-fetched of an idea. After all, they did have the strong support of their earliest investor. "She told me, 'Don't drink cheap beer'," Roc Brewing Co. co-founder Chris Spinelli says of his mom, Patty. "So we stick to that motto, and we work on building off of some of the things she taught us." So far it's going pretty well. 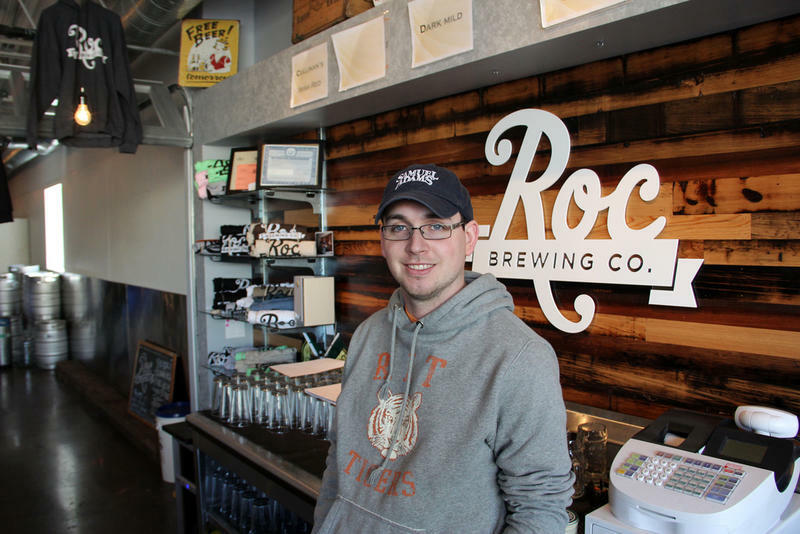 Roc Brewing Co. is already winning national attention - just five months after opening its sleek new downtown microbrewery. 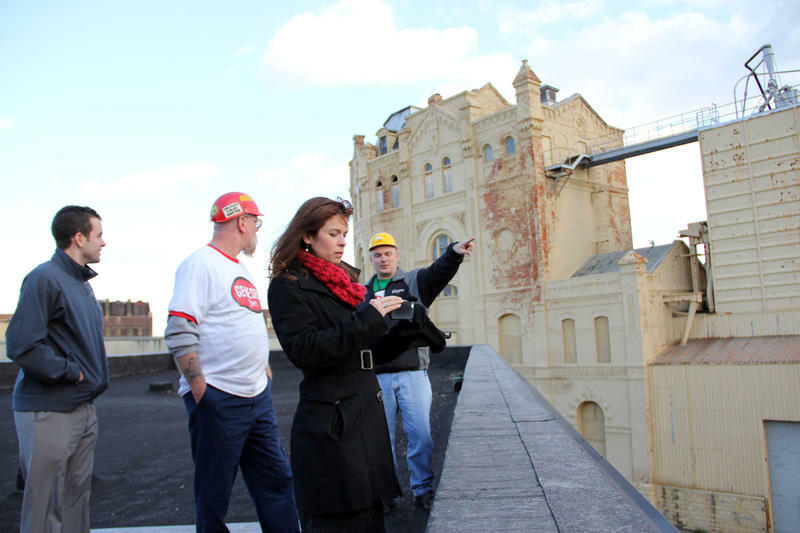 The good news: Rochester's Genesee Brewery is spending $2.6 million to transform an old packaging building into a brew pub and visitor center. 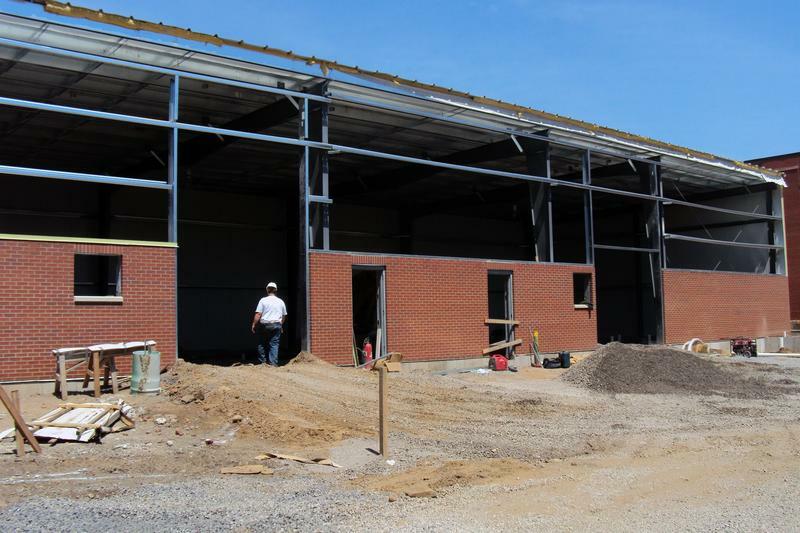 Company officials say the "Genesee Brew House" should be open by late April 2012. Rich Lozyniak, CEO of Genesee parent company North American Breweries, says the adjacent buildings will be razed to make room for parking, pending proper approval. "We don't want to make an investment in this facility and have a deteriorating building right next door," Lozyniak said at Friday's announcement.